In 1943, after first working together four years earlier, British filmmakers Michael Powell and Emeric Pressburger set up a production company known as ‘The Archers’. The company would last for around fourteen years (up until 1957), though the pair collaborated on projects as late as 1972. During their long association, they co-produced/wrote/directed a number of lauded films, including The Life and Death of Colonel Blimp (1943), Black Narcissus (1947), The Red Shoes (1948) and The Tales of Hoffmann (1951). One of their most famous films was 1946’s A Matter of Life and Death, which began pre-production during the tail-end of WWII, and began shooting about four months after VE day. 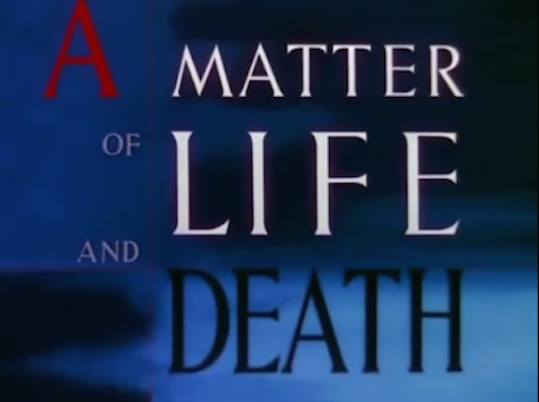 A Matter of Life and Death was its British release title, and it was released in the United States under the name Stairway to Heaven (for consistency, I’ll hereafter refer to it by its British title). This magnificent film was unique in many ways, and has been chosen as this month’s Five Star Film. Let’s look at five of its most interesting elements …. (NOTE: some spoilers ahead). Interestingly, A Matter of Life and Death begins in a similar way to another legendary classic film that opened around a week earlier*: 1946’s Frank Capra perennial gem It’s a Wonderful Life. (*It’s A Wonderful Life opened in New York on Dec 20th, 1946. 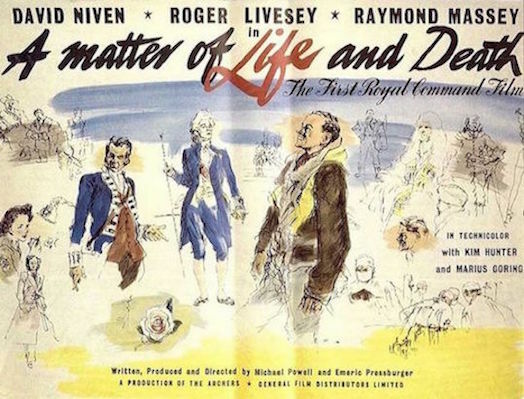 A Matter of Life and Death opened in New York on Christmas Day, and then had its UK general release on Dec 30th). Less then a minute after their opening credits, both films show a beautiful starry night skyscape, with voiceovers by celestial ‘beings’ or narrators, who introduce us (either specifically, as is the case in It’s a Wonderful Life, or generally, as in A Matter of Life or Death) to the lead character. In A Matter of Life or Death, the peaceful skyscape quickly changes to a darker mode (in colour, tone and sound), as we see and hear about a far-off burning city, then experience a thunderstorm, and a deep fog. These are quickly followed by a cacophony of voices, aircraft, storm sounds and beeps. So much happens in the first moments of the film, including the huge above-mentioned shift, before we even get our first look at the lead characters. From the onset, we’re set up not knowing what to expect. It’s a terrific start, and a sign of the diverse wonders that await us in the rest of the film. 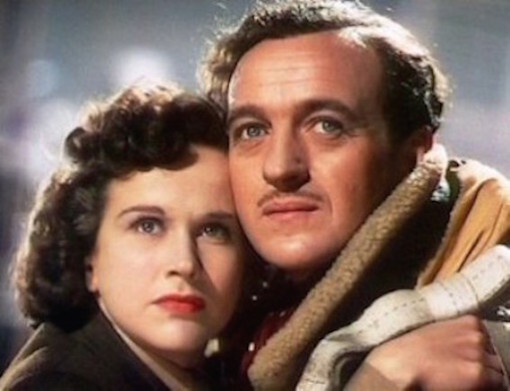 The opening sequences lead into the first scene with our exceptional lead actors: David Niven as RAF Squadron Leader Peter Carter, and a then-unknown Kim Hunter as American-born, England-based radio operator June. In this gut-wrenching scene, Peter, facing imminent death, does a lot in a few short minutes: informing June of the status of his crew and aircraft, dictating to her his final goodbyes for his family, quoting Sir Walter Raleigh, philosophising about the meaning of life, and finally, in his own way: falling in love. In the hands of a lesser director or actors, this scene could just be pure schmaltzy melodrama: but it’s so much more. It’s absolutely, genuinely, moving. The aggregate of Peter’s stoic bravery and June’s extraordinary combination of professionalism and human compassion makes for truly gripping scene. As an audience, we’re thrown right in the deep end very early. We’ve already invested in these characters, surprisingly seen their love blossom almost instantly, and now we’re faced with the loss of one of them. But here’s the extraordinary thing: all is not as it seems. We’ll soon learn that Peter inexplicably survives his prescribed death. And the consequences of this make for a fascinating and multi-layered film experience. Peter’s unexpected survival means we get to see ‘The Other World’ (A Matter of Life and Death’s version of Heaven, though it’s never referred to as such in the film). In a genius move, the filmmakers decided to go for what I like to refer to as a ‘Reverse Oz’. Seven years before A Matter of Life and Death, the beloved classic The Wizard of Oz (1939) employed the technique of using black-and-white (well, technically sepia) for ‘the real world’ (ie Kansas), and vibrant Technicolor for ‘The Other World (ie Oz). Here in the latter film, The Other World is monochrome, and ‘the real world / the present’ is seen in glorious (three-strip) Technicolor. It’s a fascinating and inspired design choice. In an early scene where someone from The Other World first visits Earth, he cheekily comments (breaking the fourth wall) that 'one is starved for Technicolor up there', in reference to The Other World. We first see the richness of colour in A Matter of Life and Death very early on. In the afore-mentioned post-credits skyscape, the sky is a gorgeous (almost ultra-marine) blue, and soon after we see a brilliant burning red through June’s radio room windows, as London suffers extensive and explosive bombing. Other later colour scenes include one in a beautiful flower-filled garden park. By contrast, The Other World is visually striking in different way. With its forced perspective, enormous stadium-like areas, and (speculatively) futuristic costuming, it’s majestically grand. Pre-dating the start of The Twilight Zone (1959-1964) by well over a decade, it reminds me of some of the black-and-white futuristic sets created at CBS for various episodes of Rod Serling’s masterpiece TV series. One particularly beautiful shot in A Matter of Life and Death sees inhabitants of The Other World looking down to the Earth, via large, window-like circular holes (a direct symbolic link to an earlier scene, on Earth, where a doctor looks down (‘God-like’) over the activities of the local townsfolk, via his camera obscura. In addition the afore-mentioned leads, there’s a wonderful supporting cast. One particular standout is Raymond Massey (as a disgruntled Brit-hating American from the late 18th Century), a decade and a half before his TV star-turn as Dr Gillespie (opposite a young Richard Chamberlain) in TV’s Dr Kildare series (1961-1966). His unmistakable, commanding, speaking voice grounds his character beautifully, in a relatively small, but pivotal role. Another fine performance is from Robert Livesey as the doctor who begins on Earth, and then plays a vital role in The Other Place. There’s also the tiny (one-line) role of an English pilot, played by a sweetly baby-faced (pre-Sir) Richard Attenborough. Young ‘Dickie’ had just turned 23 four days before shooting began, but he looks about 12! A Matter of Life and Death is a fabulous British classic. If you haven’t seen it already, it certainly deserves a viewing. I assure you you’re in for a treat. And those who have seen it will know what a rich experience it is. Like me, many of them re-visit it again and again.